The 1901 census extract above lists George and Margaret Bradford living in rooms at 26 Zennor Road, Balham. They had been living here from at least the late 1880's. Margaret was now the oldest surviving child of George Aitchison, the cabinet maker. The couple remained living here until George died in1907 and Margaret died in 1909. 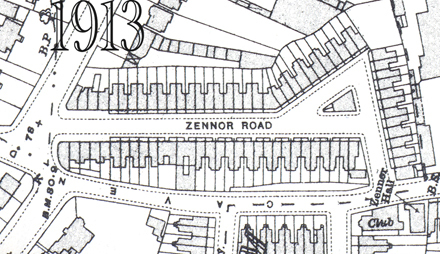 The two maps below dated 1870 and 1913 show the developement of Zennor Road over that period. 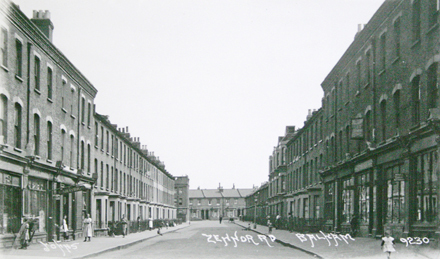 The photographs below show on the left the view down Zennor Road from the junction with Weir Road. The right hand photo shows the other end of Zennor Road viewed from the junction with Cavendish Road. 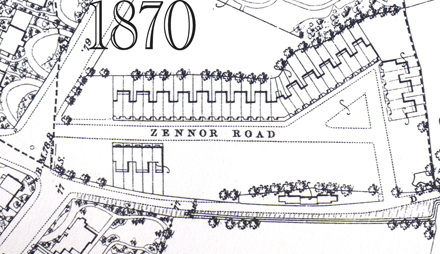 Although Zennor Road still exists today all of the housing shown in these pictures has been demolished and replaced by an industrial estate. 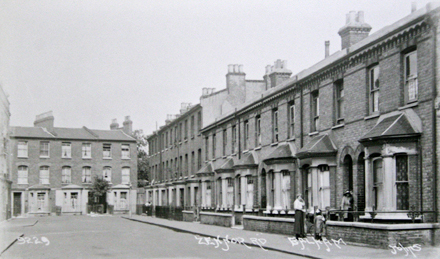 These two photographs were published by Johns of Tooting who produced many post card views of the area between 1910-1920. Both pictures create the atmosphere of the times.